A common expression heard in taverns is “Pick your poison…”. With this guide, a savvy assassin will be able to pick the right poison for the job or to satiate the saltier clients with a need for increased suffering of the victim. When slotted, poisons suppress weapon enchantments. The rank or level of the poison determines the duration if there is an overtime effect, otherwise, the effect is increased. Some potions offer benefits to the user in addition to negative effects to the victim. Stun effects have shorter durations. Some poison provide benefits to the user. 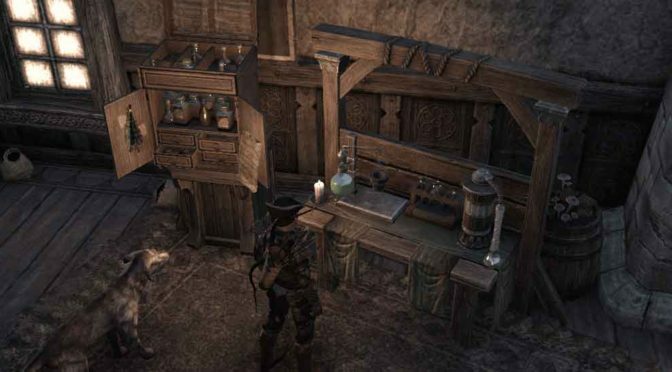 Poisons are made in batches of 16 when the alchemy passive Chemistry is maxed. When slotted on a weapon, their effect overrides the weapon’s enchantment (if one is present). The Rank of the potion will determine the duration of the effect or the intensity of the effect. All Poisons are applied 20% of the time on Light Attacks, Heavy Attacks, or Weapon Abilities. Oils are found on the tougher mobs, including ogres, trolls, giant snakes, and daedra. *Pitch-Bile: Didn't have any at the time of this document was revised. There are thirty known alchemical traits in Tamriel. This tome listed the effect of each when combined with oil instead of a solvent. Note: CP150 Values are shown below without any Champion Points spent on an Orc with some passives that may affect results. The values will likely be slightly different from yours. Applies Minor Fracture to your victim, reducing Physical Resistance by 1320 for 6.5 seconds, 10 second cooldown. Inflicts Minor Fracture to your target and grants you Minor Resolve, reducing their Armor by 1320 and increasing your Armor by 1320 for 3.5 seconds, 10 second cooldown. Exposes your victim, preventing them from stealthing for 5.5 seconds, 10 second cooldown. Marks your victim, permitting you to see them while stealthed for 10.5 seconds, 1 second cooldown, 10 second cooldown. Drains Health from your target, dealing 1266 poison damage to your target and restoring 1266 Health to you per second for 6.5 seconds, 10 second cooldown. Deals 1266 Poison Damage per second for 6.5 seconds, 10 second cooldown. Drains Magicka from your target, increasing the cost of their Magicka abilities by 60% and restoring 238 Magicka to you per second for 5.5 seconds, 10 second cooldown. Increases the cost of your victim’s Magicka abilities by 60% for 10.5 seconds, 10 second cooldown. Applies Hindrance to your target, reducing Movement Speed by 50% for 10.5 Seconds, 10 second cooldown. Inflicts Hindrance to your target and grants you Major Expedition, reducing their Movement Speed by 50% and increasing your Movement Speed by 30% for 5.5 seconds, 10 second cooldown. Applies Minor Uncertainty to your victim, reducing all critical ratings by 657 for 10.5 seconds, 10 second cooldown. Inflicts Minor Uncertainty to your target and grants you Minor Prophecy, reducing their Weapon and Spell Critical by 657 and increasing your Spell Critical by 657 for 5.5 second, 10 second cooldown. Applies Minor Breach to your target, reducing Spell Resistance by 1320 for 10.5 seconds, 10 second cooldown. Inflicts Minor Breach to your target and grants you Minor Ward, reducing their Spell Resistance by 1320 and increasing your Spell Resistance by 1320 for 5.5 seconds, 10 second cooldown. Applies Minor Cowardice to your target, increasing the cost of Ultimate abilities by 60% for 6.4 seconds, 10 second cooldown. Inflicts Minor Cowardice to your target and grants you Minor Sorcery, increasing the cost of their Ultimate abilities by 60% and increasing your Spell Power by 5% for 3.5 seconds, 10 second cooldown. Increases the cost of your victim’s Stamina abilities by 60% for 10.5 seconds, 10 second cooldown. Drains Stamina from your target, increasing the cost of their Stamina abilities by 60% and restoring 238 Stamina per second to you for 5.5 seconds, 10 second cooldown. Immobilizes your victim for 5.5 seconds, 10 second cooldown. Immobilizes your target and grants you Unstoppable, rendering you immune to control effects for 3.9 seconds. This poison will also break you free of ongoing control effects, 10 second cooldown. Applies Minor Enervation to your victim, reducing all Critical Damage by 12% for 10.5 seconds, 10 second cooldown. Inflicts Minor Enervation to your target and grants you Minor Savagery, reducing their Critical Damage by 12% and increasing your Weapon Critical by 657 for 5.5 seconds, 10 second cooldown. Applies Minor Maim, reducing your victim’s Damage by 15% for 3.5 seconds, 10 second cooldown. Inflicts Minor Maim to your target and grants you Minor Brutality, reducing their Damage by 15% and increasing your Weapon Power by 5% for 3.5 seconds, 10 second cooldown. Inflicts Minor Vulnerability to your target and grants you Minor Protection, increasing damage your victim takes by 8% and reducing your damage taken by 8% for 1.6 seconds, 10 second cooldown. Inflictions Minor Vulnerability, increasing damage your victim takes by 8% for 3.9 seconds, 10 second cooldown. Inflicts Minor Defile to your target and grants you Minor Vitality, reducing their healing taken by 15% while increasing your healing taken by 8% for 3.9 seconds. Deals 822 Poison Damage per second to your victim and restores 822 Health per second to you for 6.7 seconds, 10 second cooldown. Deals 822 Poison Damage per second for 10.5 seconds, 1 second cooldown. Inflicts Minor Defile, reducing healing your victim takes by 15% for 3.5 seconds, 10 second cooldown. Quickly Discover Every Alchemical Reagent’s Traits, Sunshine Daydreams (Includes Dark Brotherhood content).